“Do more with less,” has become a trope in the industry, whether it be out of lean team necessity or a desire to be more efficient with finances. Gone are the days of highly-specialized hardware and software engineers—in the past, there could be 150-member teams to support and maintain a single large application. But in today’s modern landscapes, companies expect IT professionals to wear a lot of hats and cover a spectrum of skills, hardware, and processes. Instead of hiring redundant W2 expertise, most companies can reduce their OPEX by 30-40% by outsourcing some of their IT field services to external vendors. But more vendors isn’t the answer. 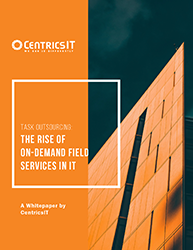 Download the free whitepaper to learn how On-Demand Field Services can help you scale your team globally.